Aurora Dental provides dental bridges in Aurora, OH. Call 330-562-3400 to learn more and schedule your appointment. Missing one or more teeth is common for many people. In fact, the American Dental Association (ADA) reports that the average adult patient has three missing or decayed teeth. If you are missing one or more teeth in a row, a dental bridge may the best solution for you. As the name suggests, a dental bridge bridges the gap where teeth are missing. It has two main components. The abutments are crowns on the adjacent natural teeth or dental implants that support the bridge. The pontics are artificial teeth that replace the missing teeth. In the most common type of dental bridge, crowns are cemented onto the natural teeth at either end of the span of missing teeth. This creates a strong, durable support structure for the bridge. 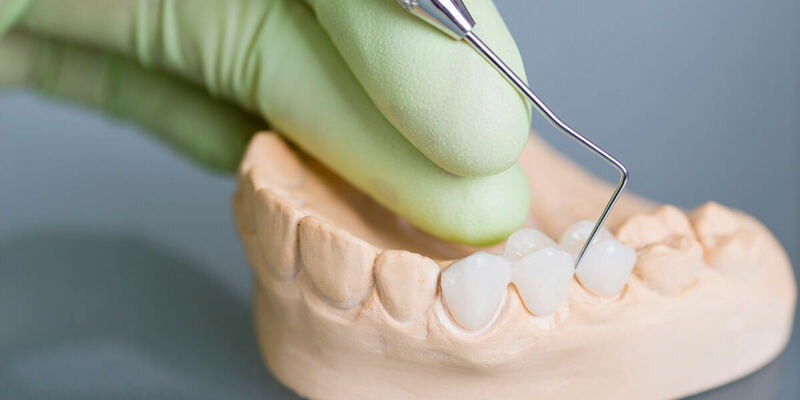 However, it does require us to shave down healthy tooth structure to prepare the adjacent teeth for the crowns, raising the risk of tooth decay or even fracture in those teeth. Supported by a metal structure that is cemented to the back of the teeth, a Maryland bridge preserves the healthy structure of the supporting teeth. It does add pressure to those teeth, but the risks are lower than those of a traditional bridge. However, a Maryland bridge is not as capable of managing the forces of biting and chewing as a traditional bridge. If you are missing three or more teeth in a row, an implant supported bridge is the best option. It is more expensive than the other types of bridges, but it allows us to preserve the natural teeth by anchoring the bridge to a pair of dental implants rather than the teeth. It is strong, durable, and extremely long-lasting. No single type of dental bridge is right for everyone. We will carefully examine your teeth and help you decide which type of bridge best fits your unique dental situation, as well as your budget and your goals for treatment.